1.”Cain and Moore are right“? We were so stunned to read this that, for a brief moment, we actually wondered who Moore was and whether the author meant to say Cain and Abel. Not joking folks. That was our instant thought. Because the author of the statement has been scathing towards President Trump’s economic pronouncements since the 2016 election. David Rosenberg‏ @EconguyRosie Apr 4 – Excited about the big reflation trade? Take a good hard look at the charts below. Global deflation, not inflation, is the primary fundamental risk. I can’t believe I’m saying it, but Cain and Moore are right! 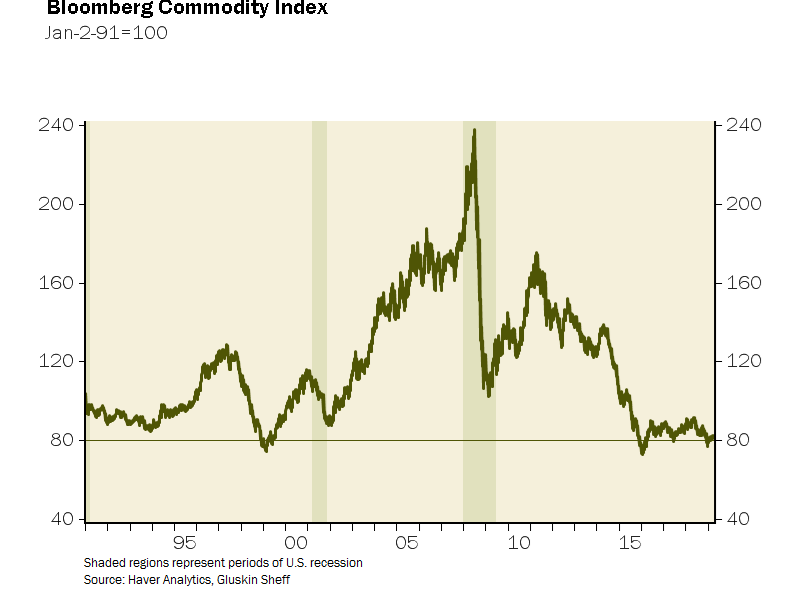 But what about commodity inflation coming here from emerging markets? jeroen blokland‏Verified account @jsblokland – One source of ‘developed market’ #inflation used to be ’emerging market’ inflation, #China being the best example, but this is no longer the case. 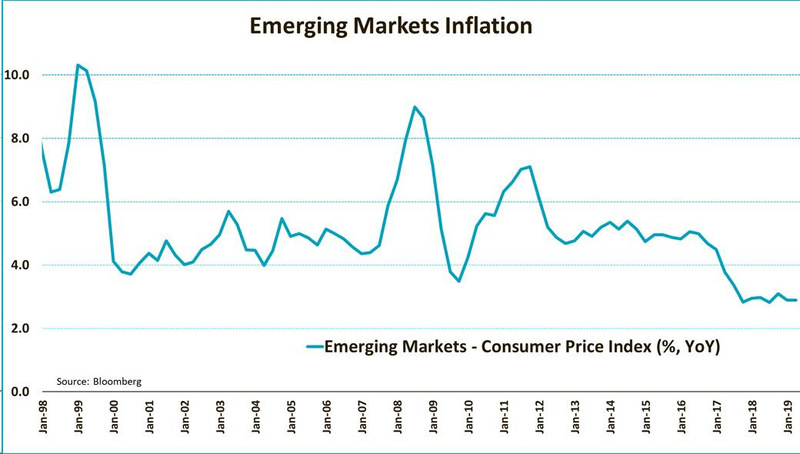 Emerging market inflation has fallen below 3%. But Rosenberg’s tweet was on Thursday, April 4, a day before the Non Farm Payroll number. Surely, a stronger than expected jobs number & a higher wages number would create some inflation concerns. And that number did come in at 196,000 with last month revised from 20K to 33K. 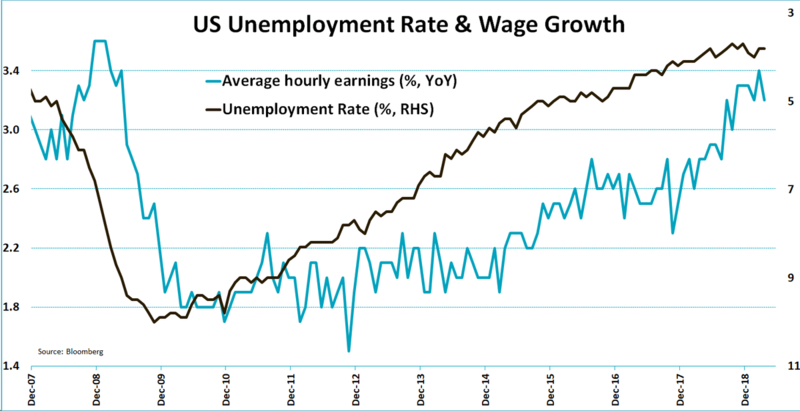 jeroen blokland‏Verified account @jsblokland – US #wage growth unexpectedly fell to 3.2% in March, down from 3.4%. #Inflation risks from labor market remain limited. David Rosenberg‏ @EconguyRosie – The Potemkin labor market! Over half of the payroll gains so far this year have come from the BLS ‘birth-death’ model!! Three-quarters from this ‘magic wand’ in Feb-March. Meanwhile…household employment has shown NO growth at all year-to-date. But what is the “key” in this payroll data? David Rosenberg‏ @EconguyRosie – The key in the payroll data was the 5k drop in cyclical employment. Negligible wage growth. Hours worked was all a construction skew. Declines in manufacturing jobs and overtime are an ominous sign. Is there an overlooked & leading indicator that suggests the same? Could there be a more negative way to describe job growth? 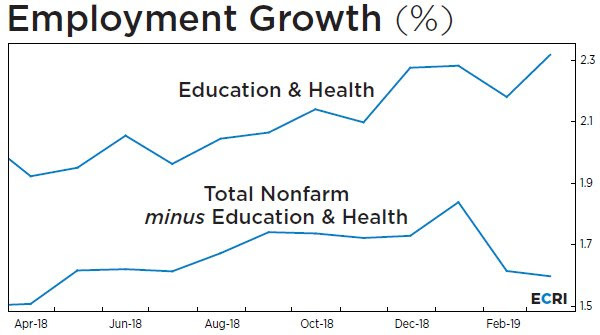 Lakshman Achuthan‏Verified account @businesscycle – The more cyclical component of #jobs growth remains under pressure, with yoy nonfarm jobs growth excluding education and health falling to an 11-month low. What does it mean for the economic cycle? 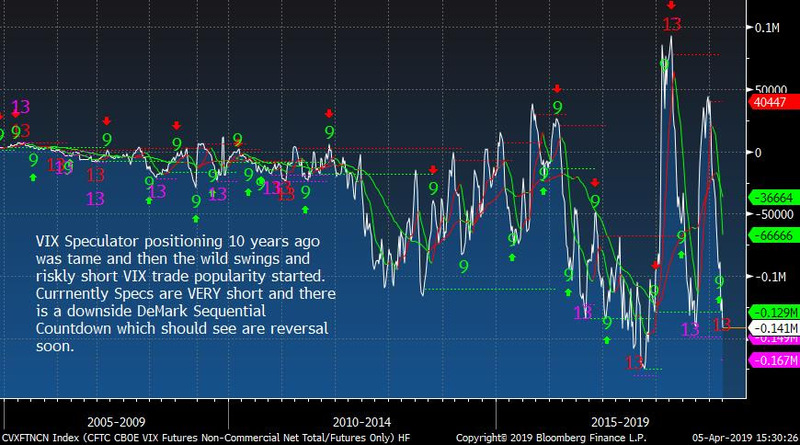 David Rosenberg‏ @EconguyRosie – When we see declines in transports (-2k), retail (-12k) and manufacturing (-6k), you know that the cycle is showing signs of fatigue. Bond market has this figured out. Yes, indeed! A few minutes prior to 8:30 am on Friday, we had jotted down yields along the Treasury curve – 30-yr at 2.943%; 10-yr at 2.54%; 7-yr at 2.436% & 5-yr at 2.346% . As soon as the NFP number hit, yields rose instantly. But then yields along the 30-5 year curve fell & closed down in a parallel shift down 3.6 bps on the day. The 3-year, 2-year & 1-year yields closed down 2 bps & 1.5 bps & 1 bps resp. from their pre-NFP levels. In contrast, the U.S. stock market rose in happiness because it considered the NFP numbers as perfect for rallying. The S&P 500 and NDX rose about 50 bps while the Russell 2000 rose by almost 100 bps. What gives? As Jim Bianco told Rick Santelli, the bond market & the stock market do give different messages at turns. That was not merely true in 2007 but also in 2009 when the bond market was saying things will get better while the stock market was falling off a cliff. This time Bianco is siding with the slowing growth message of the bond market. Jeff York, PPT‏ @Pivotal_Pivots – Wed Mar 27 – 10 yr. bond yields $TNX is near my 1st. 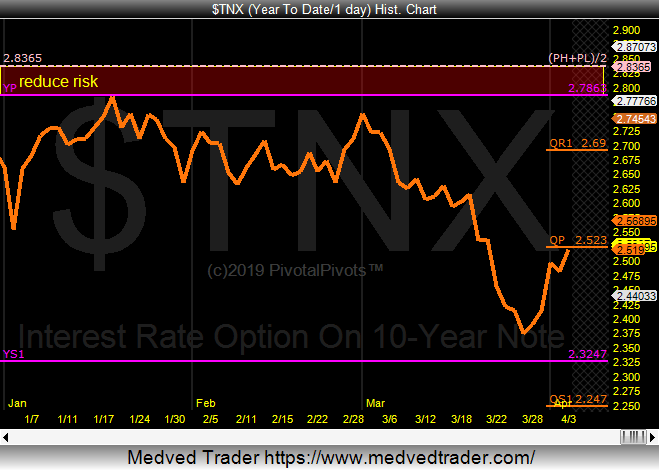 2019 target at the Ys1 pivot @ 2.32%. YP to Yr1 is a computerized algorithmic move @PivotalPivots. Jeff York, PPT‏@Pivotal_PivotsApr 3 – 10 yr. bond yields $TNX today, is testing resistance at the Qrtly Pivot(QP). The QP, should be strong resistance @PivotalPivots. But the bond market movements are more about positioning, right? An important question is whether rates are falling because of falling inflation or falling growth? 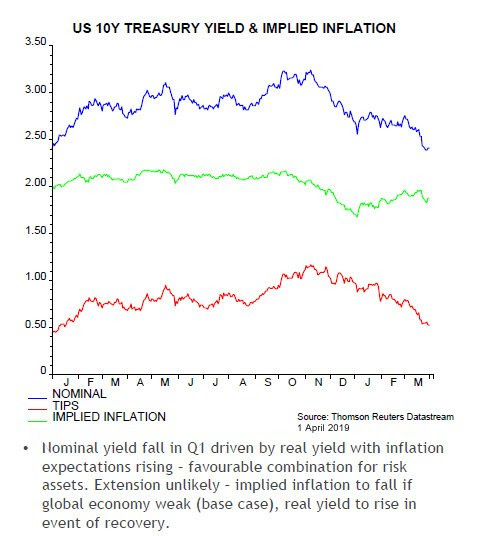 Jenna & John‏@StrategicBondApr 2 – Bulk of the Q1 move in US 10-year Treasury bonds has been falling real yields, while inflation expectations have actually risen a little; per Simon Ward, our Economic Adviser. So is there anything that might suggest a further fall in rates due to slowing economic growth? Our strongest recommendation to Chairman Powell is to listen, watch & imbibe this style. That alone would enable him to not scare markets the way he did in his last two FOMC pressers. 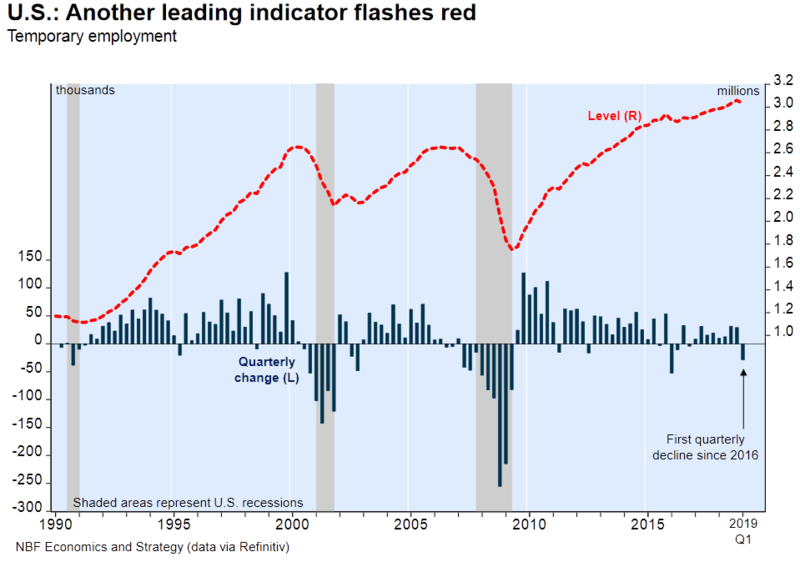 Now if you like getting scared and, frankly, even if you do not, you should watch the 31 minute Real Vision video with Lakshman Achuthan of ECRI, titled Cycling into Slowdown. The first section, in a Complexity Theory kinda way, speaks of a window of vulnerability developing in the economy that given an exogenous shock can send the economy into recession. The real message of the video (filmed on March 13, 2019) is that we are “getting closer & closer to a window of vulnerability” in the US & global economy. He says that “the prospect of a sustained upturn in PMIs any time soon is pretty low“. His coup de grace is that the “leading indicators in non-financial services where 2/3rds of Americans work have rolled over & are decelerating“. This is a very different message from Larry Kudlow’s but the solution is one that President Trump & Dr. Kudlow are suggesting, right? Wouldn’t that make Cain & Moore right as well? Holger Zschaepitz‏ @Schuldensuehner – This chart highlights the madness of markets. Volatility has dropped despite flattening of the yield curve. 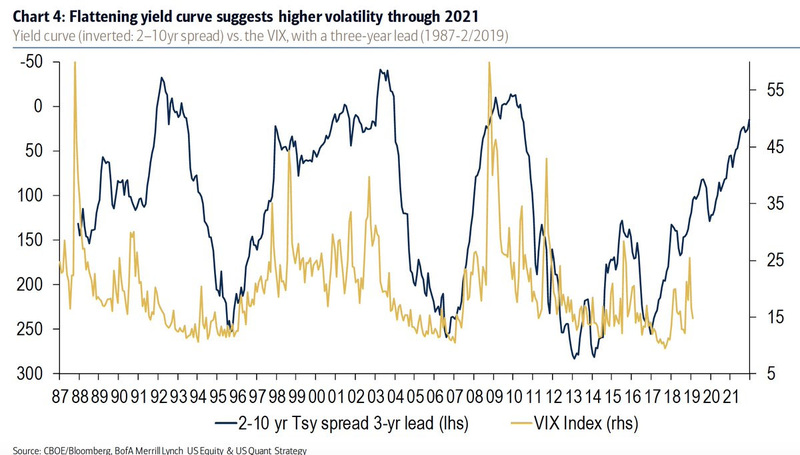 Flattening yield curve suggests higher volatility through 2021, acc to BofAML. But $VIX closed below 13 this week. So the trend is towards a lower & lower VIX. But is that trend near exhaustion? Combine the two above and? Thomas Thornton‏ @TommyThornton – Add to the mix very low short interest on the major ETF’s in the US and very high short exposure on $VIX. Keep buying or bye bye? My view is it is essential to take down risk if long. SentimenTrader‏Verified account @sentimentrader – $SPY has gapped up for its 7th straight session, and it’s on the heels of a 100-day high. That hasn’t happened since January 2018. 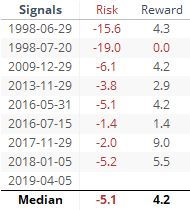 Over the past 20 years, here’s the risk/reward over the next 3 months. The guru opinions we featured last week were all bullish. That led us to wonder how ironic it would be if this week saw a downdraft. This week was a resounding confirmation of the bullish opinions. In contrast, this week’s guru opinions are all bearish. So we have to wonder, even hope, for an ironically bullish week next week. Raoul Pal‏Verified account@RaoulGMIMar 31 – Bonds and Dollars. I think this will be likely the theme for 2019. I starting to re-add dollars to my core trades. 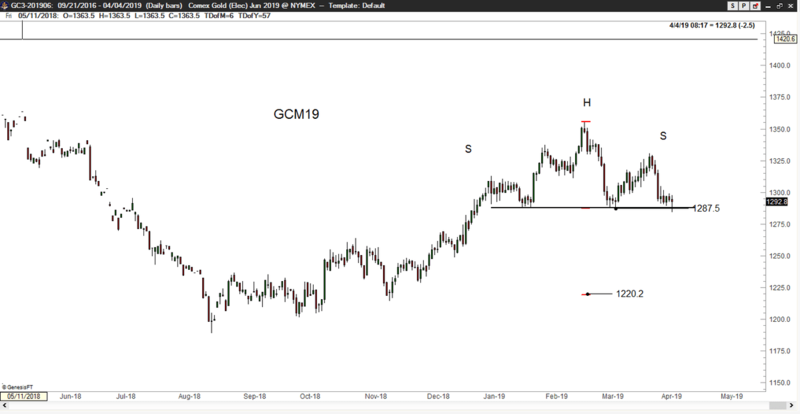 Just finishing off my April Global Macro Investor (GMI) publication on it now. There are some strong positives in place for Emerging Markets. First they broke the long downtrend resistance in January and kept going. Next they confirmed a double bottom by rising over the December bounce high. They have been consolidating in a bull flag over the past 2 months, which suggests a Measured move to about 48 on a break to the upside. During the consolidation the momentum indicators have also reset from overbought conditions. The MACD is back near the zero line and has plenty of room to move back higher now. The RSI is bouncing off of the lower end of the bullish zone. But the one concern is that the bounces have been making lower highs since the start of February. This divergence is not a show of strength. 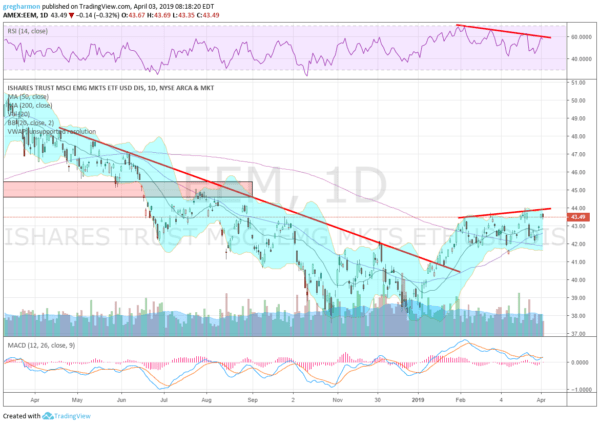 Emerging Markets may break out higher but taking a cautious stance until they do seems prudent for now. And what can we say about Oil except to say we have no clue what is going on. Oil was up 5% this week, perhaps due to Libyan civil war. 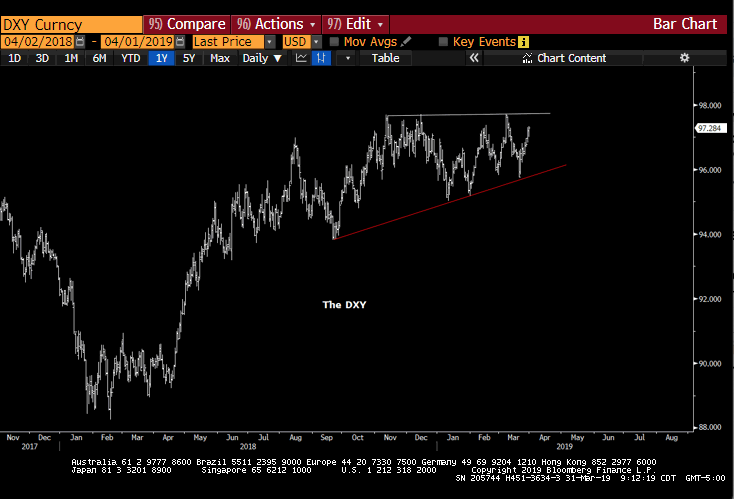 Frankly, with economies slowing down all over the world, Dollar rallying somewhat & rates falling, why is Oil on such a ramp? Last time we saw that was in 2008. And we don’t want to think about that, at least not right now.